Leopard geckos are very friendly and docile animals. They make a great family pet and are easy to care for. Leopard geckos, like bearded dragons, are incredibly easy to care for. They are not picky eaters, they will drink from a water bowl, and will gladly allow you to pick them up and gently hold them. How large does a tank for leopard geckos need to be? 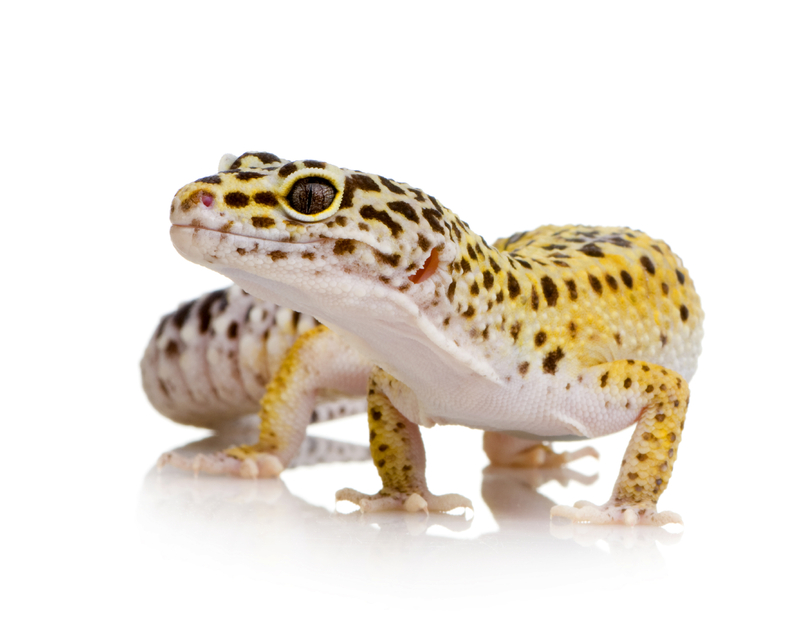 An average leopard gecko needs a 10 - 20-gallon tank. How many leopard geckos can I keep in one enclosure? Adult male leopard geckos can be hostile to one another, and therefore need to be kept apart. In contrast, females will not act aggressively, and it is fine to keep them together. Leopard geckos will shed, adults about once a month and juveniles twice as much. Don't be alarmed if you don't see shed skin, as leopard geckos are known to eat skin after they shed. This is usually to hide evidence of their presence, as not to scare off prey, or to retain the vitamins and calcium from their old skin. What should my leopard gecko eat? How big can leopard geckos grow? ​Leopard geckos will grow to usually around 11" long. Leopard geckos are nocturnal reptiles. These items make great hideouts during the daylight hours. These rock-like bowls provide a natural look to any terrarium and are ideal for feeding and watering. Easy to clean and disinfect. Can be used during the day to provide radiant heat and establish a daytime ETR. Can be used during evening hours to view your pet without disturbing its nocturnal routine. The perfect lamp for reptiles who like to bask. Sockets are rated up to 250 watts for incandescent bulbs; the ceramic model, with protective guards, is ideal for ceramic heat emitters. Both models feature safety clamps and easily attach to the rim of all terrariums. Full-spectrum lighting closely simulates natural sunlight to provide a natural environment for reptiles, so they feel better and see better while making food colors and skin tones appear as they do in natural sunlight. The ultimate in terrarium environment control, Fluker's Repta-Lighting Hoods feature a durable aluminum shell, built-in reflectors, 6-foot cord/plug sets and extra plug-in receptacles on fluorescent and combo models.